Moira Wong Orthodontics now provides an exclusive integrated bone regeneration and orthodontics service provided in partnership with Dr Isabella Rocchietta. Bone regeneration is aimed at patients who have lost bone because of gum disease or have been involved in an accident, where the damage is so substantial that they do not have sufficient jaw bone left for dental implants to be secure. 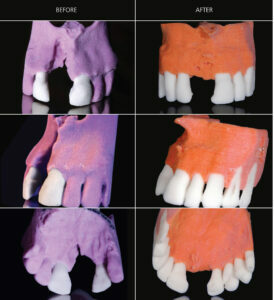 The regeneration process can grow up to 10mm of new bone allowing crowns and replacement teeth to be fitted. The process can also help save the teeth of patients where severe gum disease has spread to the bone. Dr Rocchietta is a world renowned expert on bone regeneration and the author of several peer reviewed publications and book chapters on this subject. Since graduating in dentistry in 2002, she has worked as a research scientist with the Harvard School of Dental Medicine and the Department of Periodontology at the University of Milan. She is currently affiliated with the University of Gothenburg while performing clinical work from her surgery in central London. The regeneration process utilised by Dr Rocchietta, involves dome shaped special membranes placed over bone substitute material which act as a scaffold. Blood clotting is used to create the cells that will grow the new bone. The course of treatment usually takes at least 6 months with four to five visits to Dr Rocchietta’s surgery over that period. It starts with a CT scan and the creation of a 3D model of the jaw area which is used to plan the treatment down to fractions of a millimetre. This is followed by the treatment itself and further consultations to review progress. And the magic doesn’t stop with regrowing bone. Tissue regeneration is also possible and Dr Rocchietta is developing and implementing a technique of gum grafts that can help younger patients with receding gum lines to replace lost gums. Of course bone regeneration is only one step towards recreating a perfect set of teeth following accidents or gum disease. Dr Rocchietta and the team at Moira Wong Orthodontics provide a fully integrated service. The integrated team takes patients through the relevant stages of the process of jaw surgery, bone regeneration, dental implants and corrective alignment to design individually tailored treatment plans with big smiles at the end. To find out more about this treatment contact us now.